Located on Virginia Avenue in Fletcher Place, even a cold and rainy morning could be made brighter by the spunky, warehouse-style fine diner at Milktooth. Greeted immediately by hipster hostesses and a line out the door, we knew we had found the place recommended by many Indy millennials. We put in our name for a few of the near 60 occupied seats, and headed for the combination coffee/cocktail bar. A Sunday morning favorite, the Basic B Bloody Mary was made with a refreshing, medium-spiced blend of horseradish and tomato juice, added to a pour of Aylesbury Duck Vodka, our wild-haired bartender inquired if we would like to add a cheese and meat charcuterie stick, well worth the $3 charge. My roommate ordered the house mimosa with delicious house-made orange juice. Another notable cocktail is the Desayuno de los Campeones Michelada, served with a steamed Oyster and a Viking strip of lamb—tender touches to a juicy drink. If cocktails aren’t your forte, Milktooth’s craft beer selection is also impressive. They feature rotating selections from Ommegang, Mikkeller, Sixpoint, Tank 7, New Day Meadery, Sun King and more. Want to keep your bill under $50? Enjoy the old school $3 Stroh’s bohemian-style pilsner. As we sipped our cocktails, we eyed the kitchen crew, a blur of beards and tattoos positioned behind the diner-style counter top, complete with swiveling bar stools. As they prepared delectable meals right in front of customers waiting to enjoy them, the crew moved in their small space with a graceful pace. They floated easily around each other with little verbal communication—signs of a team with chemistry. This comforting addition to Milktooth’s fresh environment prompted us to for-go a table & sit at the counter where we saw firsthand the speed and efficiency of the chefs’ work. Our server Brady, a flannel-wearing red head with wild curls, seemed busy that morning but tended to our needs well. He offered his opinions with a smile and his haircutting services to our friend. Along with the fun staff and atmosphere, the food comforted too. We enjoyed the luscious Copps Island, Connecticut oysters ($3/shell). My meal, sweet tea glazed fried chicken wings atop homemade biscuit and creamy gravy, was delightful. My companion enjoyed a fine take on steak and eggs. Although rich and organic in flavor and ingredients, Milktooth’s dishes came with a certain home-cooked quality that left us full and warm. Upon a return visit to the quiet yet thriving neighborhood joint, I was impressed once more by their gentile staff and attention to every detail. When asking to carry out the delectable wings, our waitress informed that she would need to check with her head chef if carry out was possible with the item. This, paired with the polite decline to alterations kindly mentioned on the menu, spoke wonders on the establishment’s class. 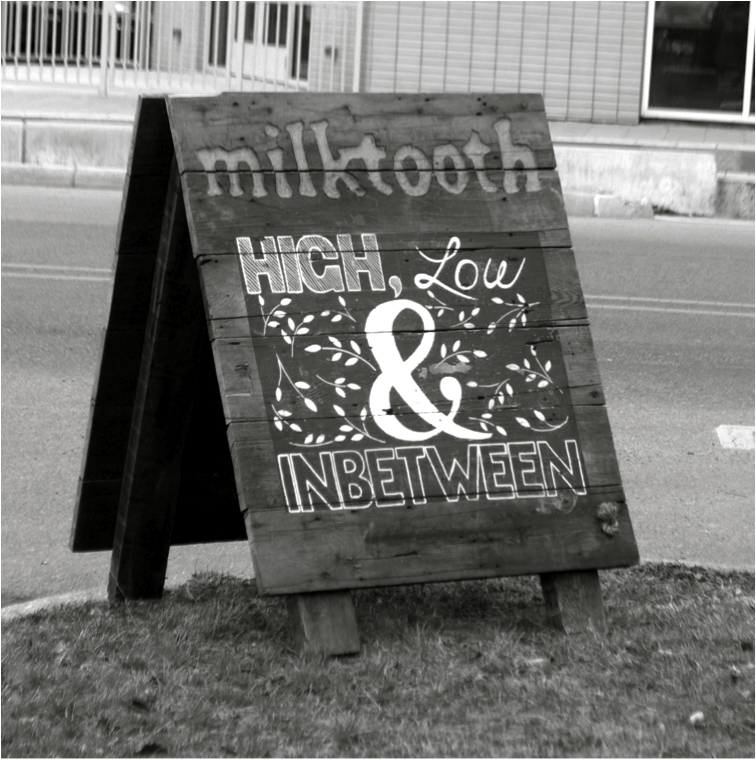 And even though their menus continue to evolve, there’s no doubt Milktooth will always be a Trndy place to eat.